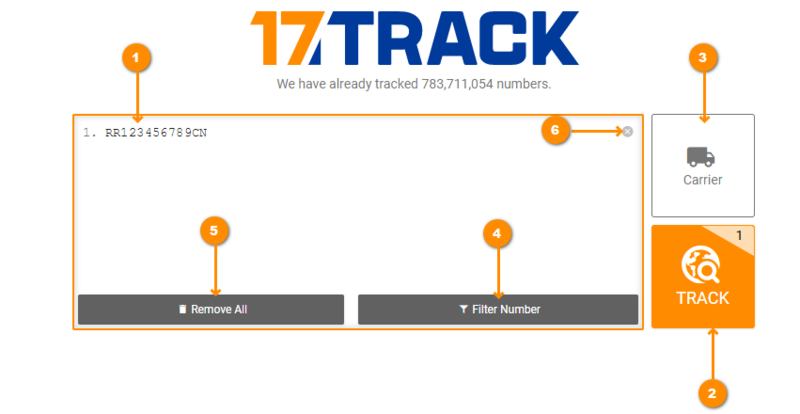 Enter your tracking number without any spaces or dashes, one tracking number per line. Up to 40 tracking numbers can be added. Please ensure the tracking number is a combination of letters or digits. See below example codes: RJ556381428CN (China Post Registered Airmail), CP921694660HK (Hong Kong Post Registered Parcel), LN328306902US (USPS E-packet Airmail), 3861078222 (DHL Express Service). Enter a valid tracking number, then click the “TRACK” button; the tracking result will be retrieved from the carrier’s official site and presented to you directly. Under normal conditions, the system will auto-detect and identify the shipping carrier, country of origin/destination. You do not need to designate the carrier manually. If there are multiple possible carriers or the system cannot identify the carrier, please designate a shipping carrier manually. The system can filter valid tracking numbers based on the default number rules. Part of a special number may require manual correction before proceeding. Delete all input in the input box. Delete one single line input in the input box. Click status icon to view the explanation of each package status. Package status indicates the current package status during transportation. The system will show auto-judged package status according to tracking event details once the tracking is complete. There are several different package statuses; Click here to learn more about package status. Under normal conditions, the system will auto-detect and identify the shipping carrier, country of origin and destination. You do not need to designate it manually. If there are multiple possible carriers or the system cannot identify the carrier, please designate the shipping carrier manually. The system will track your number according to your settings. You can also visit the carrier’s official website to learn more about shipping or delivery related problems. For single number tracking, the system will expand the details by default. For multiple tracking, the system will hide the tracking details by default. 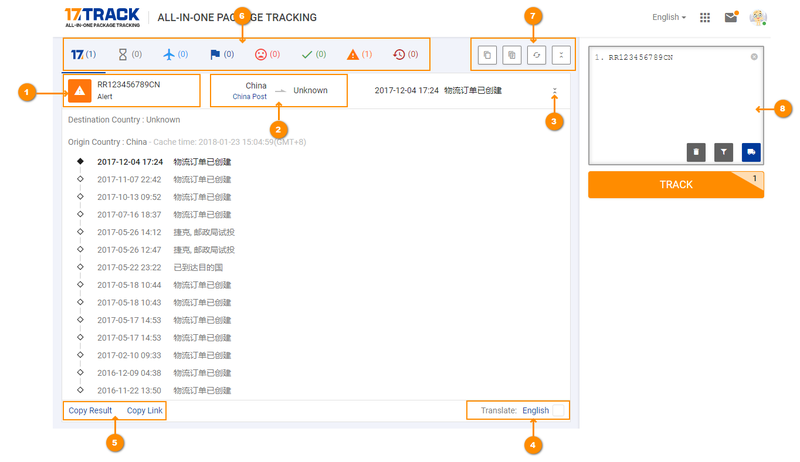 You can expand one by one or in bulk to view tracking details. You can click on language(in the bottom right corner) to change to the target language. The tracking information will be translated by BING. You can also check or uncheck to translate or cancel the translation. When the tracking is complete, if you need to share this link or tracking results, you can copy them. For multiple tracking numbers, the system will automatically classify and count the quantities according to the package status. When you move the mouses to the status icons, the system will show the definition of each status and give detailed explanation. Operate tracking numbers in bulk such as copy tracking results summary, copy tracking details. If there is an error occurred, you can refresh to track again. You can also expand or collapse the details of these numbers to facilitate your reading. You can revise, add and delete your tracking numbers in the input box on the right side. You can also manually select or designate a specific carrier to process tracking. Once you select or designate a carrier, the system will track according to your request. 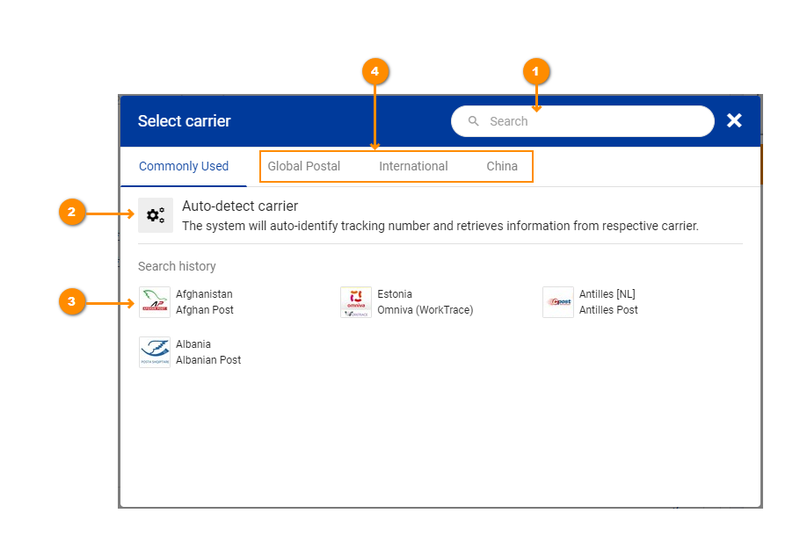 If a carrier needs to be searched manually, you can enter the carrier's name, official website or country name in the corresponding input area then you select carriers based on the search results. If you don’t know who's the carrier, please click auto-detect carrier and then the system will auto-detect the carrier. The system divides all the carriers into three categories, which are: global postal services, International express couriers and China eCommerce carriers. Global Postal is shown in alphabetical order. Thanks for viewing our user manual; if you still have doubts about using 17track.net., feel free to contact us.